Peter Rolfe deserves to be even better known than he already is, thanks to his very wonderful book, The Net on the Garage Wall, published by the Medlar Press back in 1997 and now sold out, waiting on a new edition. For some insane reason I have not reviewed it yet and I will fix that, because it really is a lovely book. It, as Peter points out on his website, enough people ask for a new edition from Medlar, it will doubtless vault up the queue! 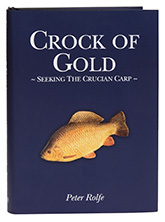 Crock of Gold takes a different perspective on fishing, which is one of the reasons why it is getting airtime here - it isn't a fishing manual, it is a book designed to enthuse people about crucians. It is a sad fact that this once ubiquituous fish is under threat, not only from pond drainage, but because it is out of fashion. And why is it out of fashion? Guess what, it isn't big enough. So the first thing you had better realise about Peter is that on top of being a talented writer and fisherman, he isn't signed up to the modern craze for pellet-fed techno carp and, in a hobby which is showing definite signs of losing its bearings as a method of relaxation, authors with Peter's approach can only be a good thing. OK, the book itself. What you get is 280 some pages in a comfortable demi, and because they are the only two criticisms I can possibly make of it, I will get 'em over with now, it is printed in brown and there is a line break between every paragraph, a combination which doesn't make Peter's writing as easy to read as it deserves. But then again, you will have that, because you will be reading this with a whisky in one hand, some evening very soon. The book isn't entirely Peter's and there are eleven additional contributors, ranging from Hugh Miles to Peter Wheat and Chris Yates, who have written a series of essays about crucian fishing that occupy the middle third of the book. With a set of authors of this quality, you can't really go far wrong and Crock of Gold doesn't. The rest of the words come from Peter's pen and comprise an introduction to crucians in Britain, some history, a review of the literature, advice from Peter's experience of running and stocking a crucian fishery, and a bibliography. There are five colour sections, so there isn't anything not to like. My advice is to buy it, even if you aren't interested in crucians, because after reading it, you will be.